Ghhhhh I simply hate COLD weather! Just a quick post today! Today it's Tuesday, that means...... Tiddly Inks challenge! For the new challenge please check out this link. Also, make sure you check out the new digi stamp. Super cute design. 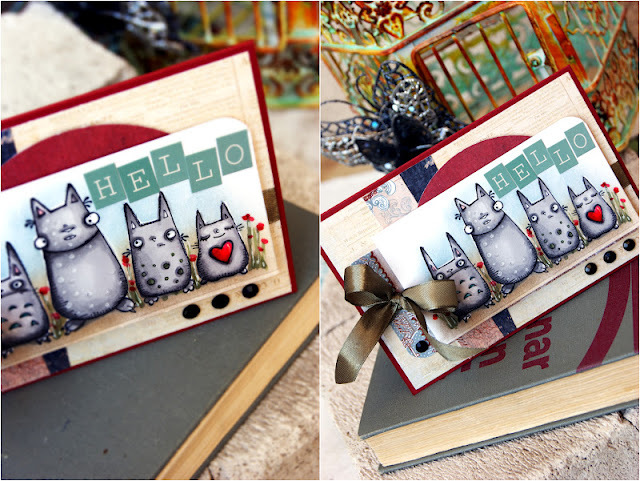 For this adorable card I used Wryn -Hanging around digi stamp from Tiddly Inks! Don't forget to check the challenge and play along with us! GHH! I hate cold and rainy weather! I miss spring and summer! 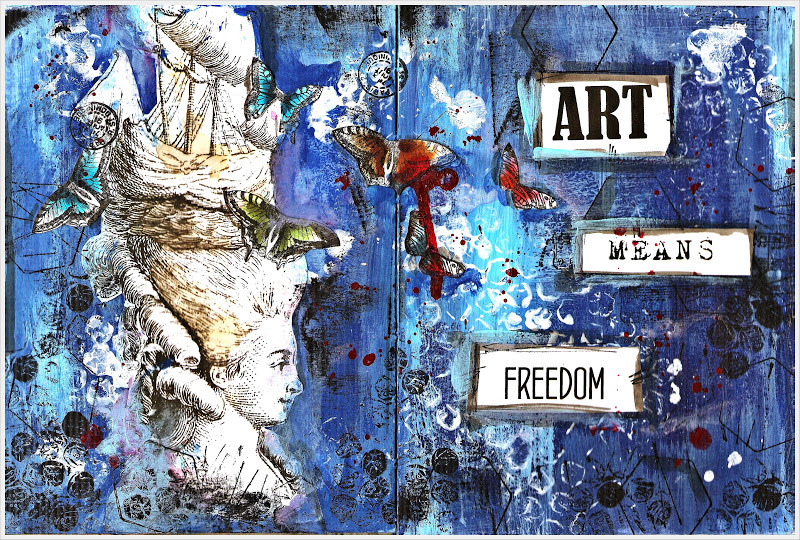 Today I would like to share my mixed media page '' Art means freedom''. As you can see this page is pretty simple. But I love the background! Here is a quick video tutorial. If you have any questions please leave a comment below. Don't forget to subscribe to my Youtube for more tutorials. Thanks! Today I have a quick and adorable tag share. 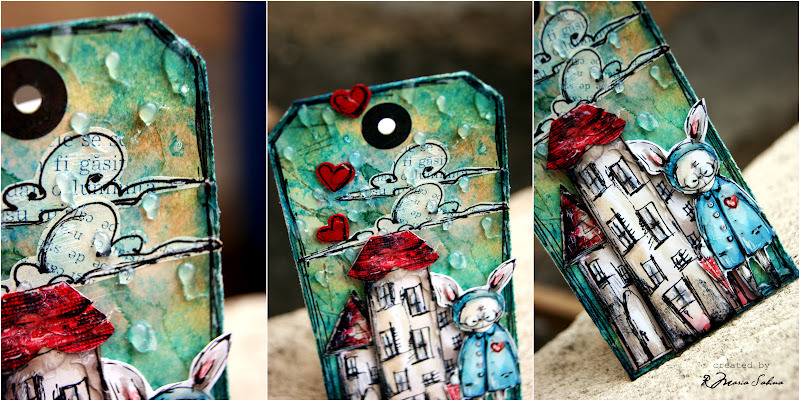 I made the tag below for Fabulous Design Team Friday over at Tiddly Inks. Every Friday new creations using Tiddly Inks designs. So make sure you come back next friday! By the way! Check out the new designs here! Super cute! For my tag , which is super adorable I used Suitcases and Wryn-Fairy Friends from Tiddly Inks. Make sure you stop by and check out the awsome DT creations. Have a wonderful weekend! That's all for today! Come back tomorrow for a new creation! Have a wonderful day! What a beautiful morning! I am back today with a new card. Oh , I love cards! I am not sure yet about holiday cards but if you have any request please let me know and I will try to make some easy tutorials. However , here is my card for today. Super cute stamp from Stampotique called Line up. If you have any question please let me know in the comment below. Don't forget to like my FB page for updates. Thanks! Have a great week! 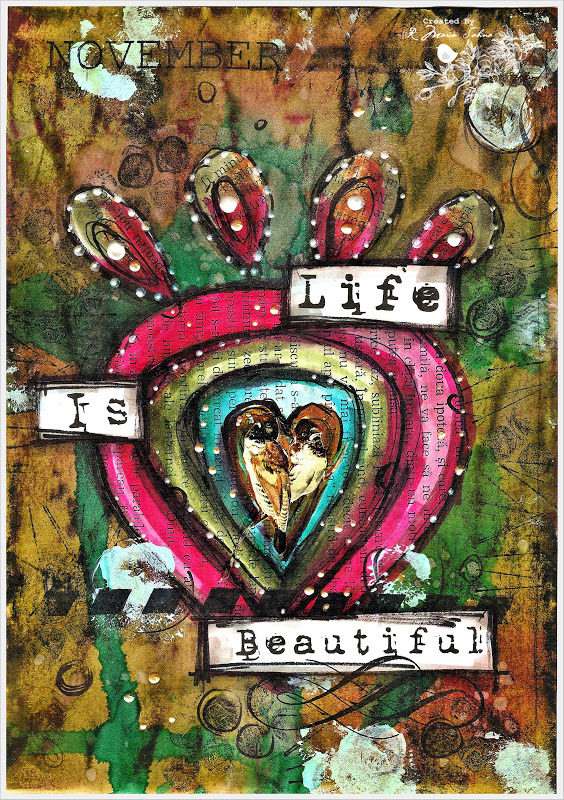 ''Life is beautiful''. Well that's true! It's beautiful when we are happy and everything works well, right? Some of you asked about the previous background I made for SDC background challenge. Here is a new creation using the same supplies but with a different twist. For this background I used distress ink, food coloring, water, copics, promakers, black marker,stamps and some random things such as bubble wrap and twine. 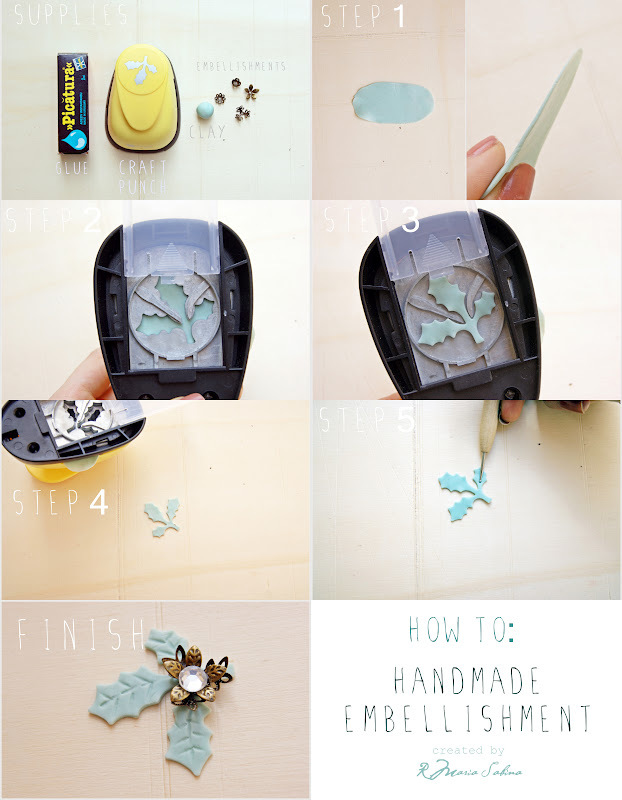 Watch the video tutorial here. Please subscribe to my Youtube channel for more tutorials. Coming up soon. Have a great day! 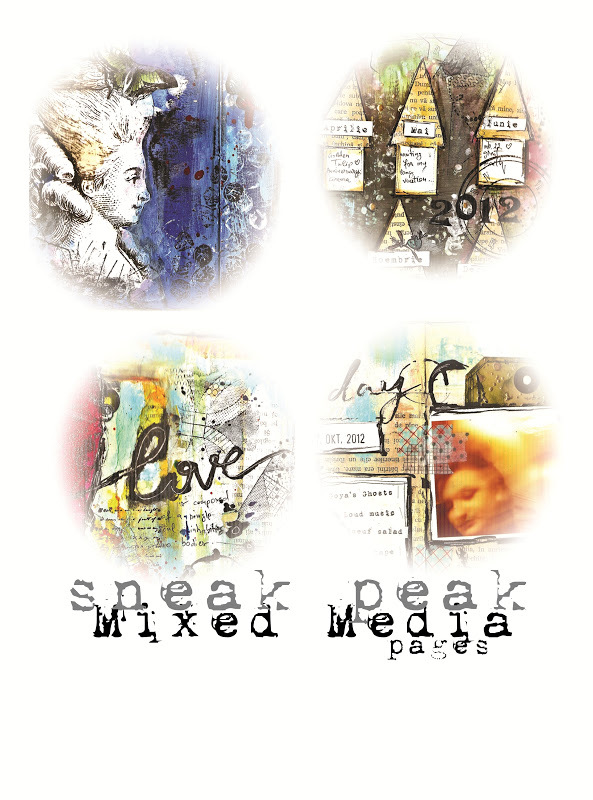 "It's my turn to set the theme this week for the Stampotique Designer's Challenge. I love to use my rubber stamps for my backgrounds, so this week you are challenged to use your stamps for your backgrounds, as well as your main focal image. Fun, right!? Here is my background for this challenge. For this background I used a few stamps. I used Oh...tree, Art lives here, Owl tree, all by Stampotique Originals. Come and play along! This challenge is so much fun! If you have questions please let me know in the comments below! Have a great day! Welcome to another Lollyrot Scrapbooking post. Today I have a card share and some news! Let's start with the card share. I made the card below for a great challenge. 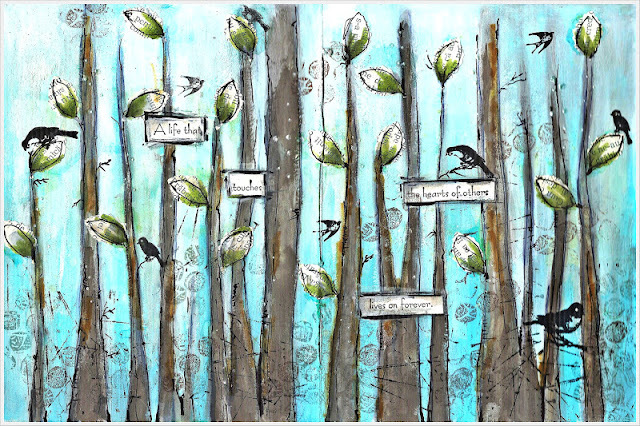 Tiddly Inks is challenging you to create a card using Tiddly inks designs . The theme for this challenge is Halloween. Sounds great! Now the great news is that I've been asked by Christy to join the Tiddly Inks Design Team! Thanks Christy! For this card I used the digi stamp Precious by Tiddly Inks. Check out the online shop here. Make sure to stop by and check out the DT creations. If you have any question please leave a comment below! Don't forget to follow my blog for more posts. Thanks! Have a great day! It's finally Friday! Cold and dull day.GHHH! I am back today with a new creation. I made a new card. But this card is a bit diifferente. This is a tag card. Love it! Super quick post for today. Don't forget to leave a comment below if you have any question. Have wonderful weekend! I made this quick tutorial for a russian blog. Please check out this link for more details. Have a wonderful day! Inky fingers, hot chocolate and new project. Today I have a fun project to share. I made another camera. I made one a while ago but the new one is really cute and not so complicated. 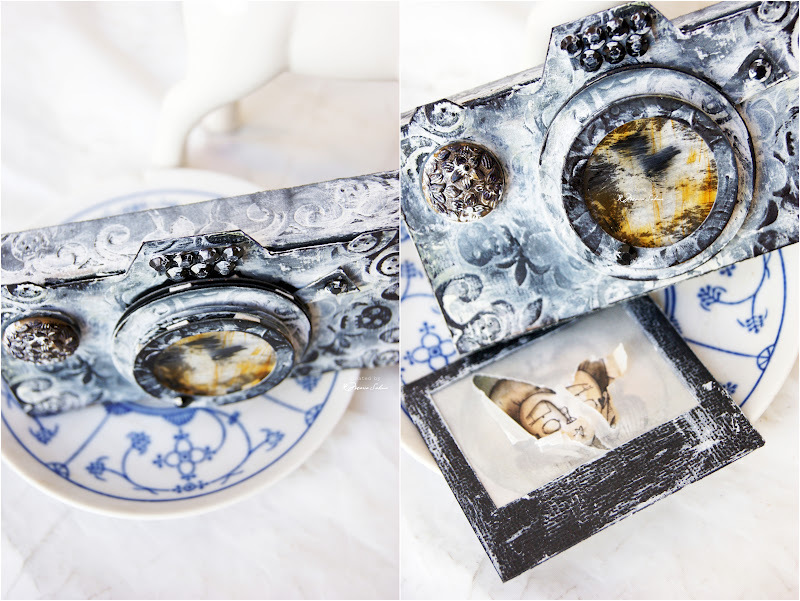 Check out the video for the first photo camera here. The good news is that I have a digital template for sale for this camera. YAY! If you are interested please send me an e-mail at nanny_pink07@yahoo.com or leave a comment below. 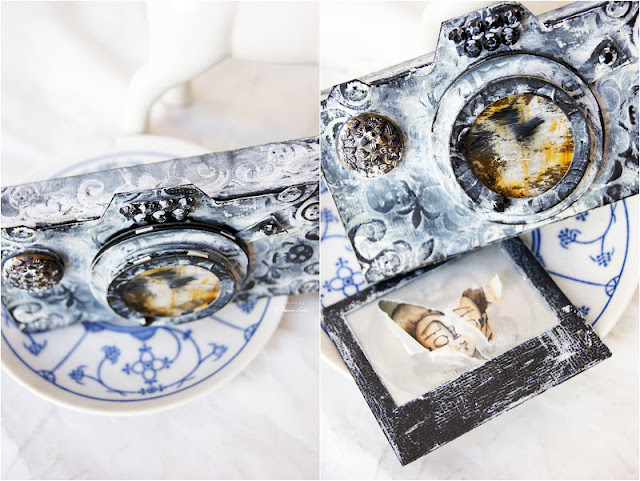 For this camera I used black cardstock , embossing folder, white paint, black ink, button, circle spellbinders, hot glue gun etc. I also made a polaroid picture using a great stamp Queen of Hearts by Stampotique. Hope you like it ! Have a great day! "Over here in England one of our main topics of conversation is the weather. We can have sun, rain, wind and snow all in the same day. So I'm challenging you to show me some weather - have fun!" 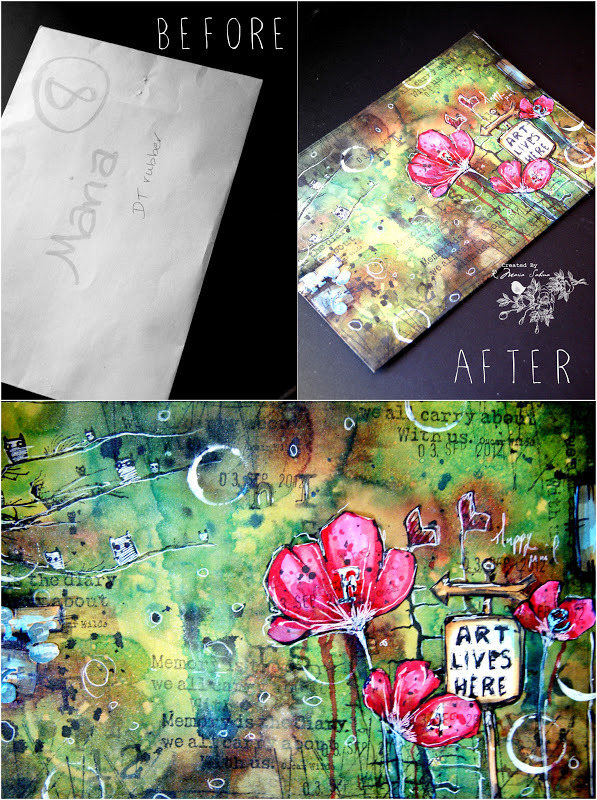 For this tag I used my stamp, Rainy day . You can get the same stamp from Stampotique Originals! Come and play along! Don't forget to check out our Design Team! Their creations are amazing! Have a great week! Today I have something D E L I C I O U S to share. I don't eat cake but I love this desert. Step 1 : Separate the egg yolks from egg white. Step 2: Take a bowl and put the egg whites in along with 30 tbsp of sugar. 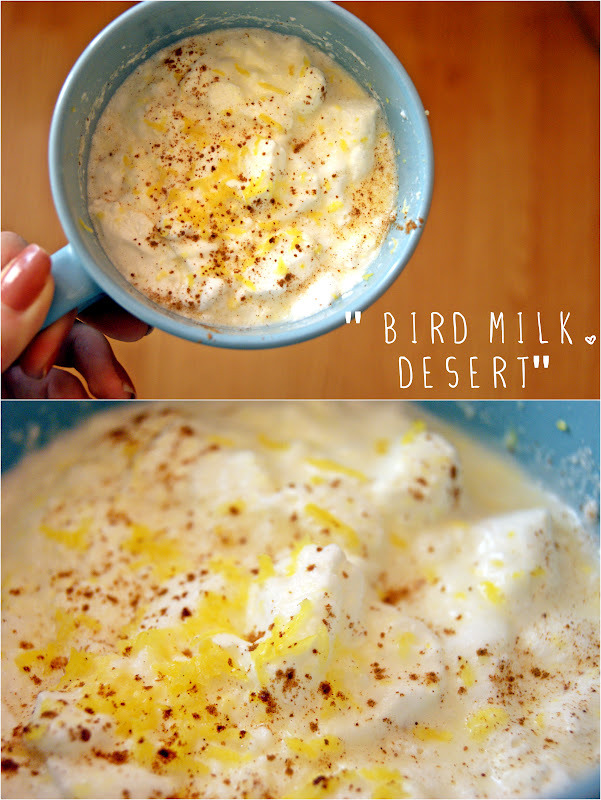 Using a mixer make a hard foam of egg whites. Step 3: Put the milk in a pot and heat it. When the milk boils, put the egg white foam ( the one you mixed before) in the milk ( they will look like dumplings..it takes less than 1 minute). Step 4: When the egg white foam is boiled, take them out from milk and place them in a strainer. Step 5 : Take the egg yolks and mix them with the vanilla sugar. Stir until it's well blended. Step 6: Put the mixture into the boiled milk. Step 7: Put the egg whites foam back into the milk pot and boil them for another 10 seconds. Step 8: Last but not least add the lemon zest and cinnamon on top. Don't mixt. Let it cool down for at least 2 hours. Enjoy!